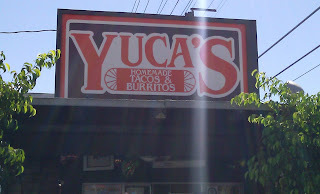 I had visited Yuca's a few times over the past few years. I had always been hoping to catch a glimmer of that James Beard Award winning excellence. In 2005, the small taco stand was recognized in the American Classics category. That was a long time ago. Yuca's had two locations, one on Hillhurst Ave., the other on Hollywood Blvd. I have tried the cheeseburger at both locations, and I have experienced similar results. The Hillhurst Ave. location shared a parking lot with a liquor store, so parking was free and plentiful. The menu was small, and the food was inexpensive. I ordered and paid at the counter and waited for my name to be called out. There was an assortment of tables and metal chairs available in the partial shade of the awning that was attached to the taco stand. After about 10 minute, my burger was ready. The Beef: The miniscule, 3-ounce patty was not especially interesting. The beef was ground at a medium setting. It was mildly beefy, and that was it. The burger was cooked hard, so it was moderately chewy. It was moist and not greasy. The beef was most likely Chuck, and the blend was most likely 20% fat. I did not interview the staff, since I didn't want to interrupt the flow of the kitchen on a busy day. Overall, the beef was fine but not interesting. The Seasoning: TOO MUCH! The burger patty at Yucs's was over-seasoned and nearly punishingly salty. There were a hint of chili powder in there, too. This was all topped off with a single drop of hot sauce. The Sear: Not so much. The burger patty received a light sear around the edges, but otherwise the beef had a steamed appearance. The Preparation: The burgers at Yuca's appeared to have been hand-formed into the tiny, thin patties. 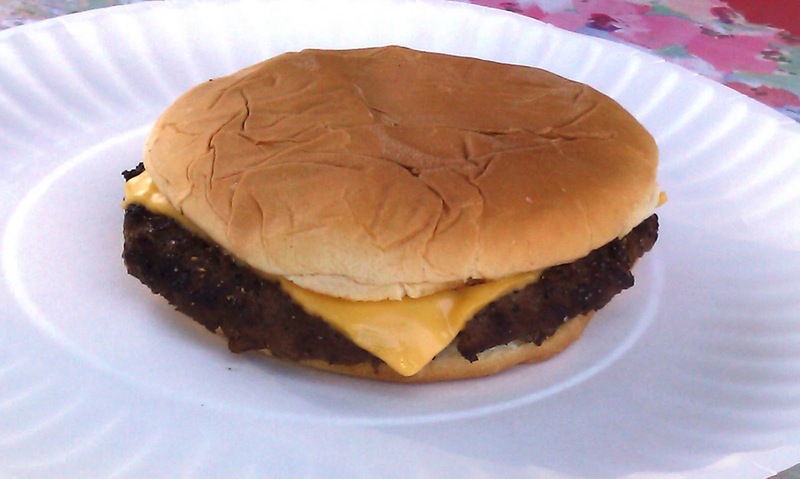 The burger meat was cooked on a moderately hot gas grill. The burgers were cooked to Well Done. The Cheese: My cheeseburger at Yuca's came with a single slice of American cheese. In spite of the diminutive patty, the cheese was barely discernible over the heavy seasoning and the cool, untoasted bun. The Bun: Blah: The bun at Yuca's was wildly uninteresting. It was a generic, burger bun. It was cool and untoasted. The bun was fresh, moist, and a just barely sweet. The Meat to Bun Ratio: This was fine, but it was a fine ratio of two completely mediocre components. The Toppings: The produce was far superior, and more filling, than the actual cheeseburger at Yuca's. The Value: A cheeseburger at Yuca's was $2.20. This felt like it was too much for a tiny burger, which was prepared in such an uninteresting fashion. Yuca's won a James Beard Award a long time ago. From what I have seen, that award had nothing to do with the quality of its burgers. If that was the case, then standards have slipped a long way since 2005. Burger Review : A cheap burger, which was prepared with little regard at Yuca's. We visited the Whataburger's a few weeks ago and the burgers were really delicious there. I think this review does full justification to their burgers. Would you like to place it on your website? I have loved WhatAburger for a long time. I haven't had one in twenty years, but I recall it being delicious.